January 26, 2019 at 11AM at the NewDay Church, 1201 First Street NE, New Prague, MN. On May 15, 1959 parents David and Janet (Locken) Otis celebrated the birth of their son, Daniel. love of music continued throughout his life. Dan never believed that he was “that good” at music, but he always helped other people learn. well. He gifted guitars to his grandsons and a ukulele to his granddaughter. He is greeted in Heaven by his father, David, and twin brother, Dennis. I’m still finding this hard to believe or accept. The news came out of nowhere for me. I knew of the accident, but had no idea that Dan was involved, and had been mortally injured. I didn’t know a great deal about Dan, but I did know him as a very fine musician. I co-hosted open jams around town(s), and he and Mary would show up now and then. EVERYBODY loved hearing them play and sing together. I can’t even begin to count the number of times when they were on the stage that people, both fellow jammers, and just music lovers, would come up to me and make stunned comments about Dan’s playing and Mary’s singing. Dan was a pure musician, who played from the heart and soul, and everybody in the room felt that. I only knew Dan as a musician and a great guy that everyone around him seemed to feel the same way about. I’m truly saddened over what happened. My heart aches for all who knew him and loved him. He will obviously be sorely missed. I’m so very sorry for this great loss. My condolences and love to all who knew and loved him. Dan was an inspiring man, proud father, and fun guy! We never got a ride in in 2018, but it’s kickstands up in heaven some day my friend. Sincere condolences to family and friends. My sympathy to Mary and family. Dan was a gifted musician and I am thankful to have played music with him for many years. We played together since our first band in 1974. As good as he was on guitar, he was an even better person. You will be missed my friend. Mrs. Polyard, I’m so very sorry for your loss of another son. We don’t know each other, but you must be a wonderful mother as your boy Dan was SO sweet. Modest, a humble soul, with a smile, friendliness, and fun. Dan left this world surrounded by so much love, he was never left alone. Someone was always touching him, comforting him, speaking softly to him; someone was always praying for him, and the tenderness surrounding your son took one’s breath away. It felt everlasting. I am a musician, and met Dan through his great friends Dave L., Tiger, Mikey and Plain White Toast. I had the honor of playing with him & Mary in their duo a couple weeks ago – I wouldn’t usually have dared to “break in” on them, because the magic they had- no one wants to mess with that! They always amazed everyone and drew you in, but that night was extra special: your son Dan soared as I’d never heard him before. He and Mary were stunning and awe-inspiring beyond their usual…I knew this as we played, not just in retrospect. It was like an unexpected Christmas present, and just kept it in my heart, grateful. Dan has obviously left a heartfelt impression on everyone who knew him, even those who were not really well acquainted with him. Everyone feels bewildered and so saddened. It’s really difficult to believe he’s gone. Thank you for bringing Dan into this world…to so many whom your son has touched in a really good way. What the freck happened? Just shocked… I met Dan through my sister Lydia and Mike Saunders when they were married, living in Lonsdale. He was part of their family. The sweetest man with a beautiful smile. Mike and Dan jammed all the time. They use to celebrate their birthdays together, since they all were in May. Dan was amazing to watch and hear! Those were the best days ever!!! RIP buddy!! My sincerest condolences to the family of Dan Otis. 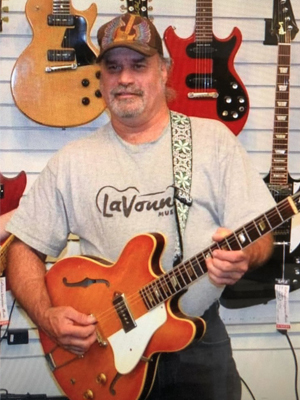 Dan touched many lives far and wide and is known by people throughout the country and likely abroad due to his gentle demeanor and extended knowledge of guitars, amplifiers and music in general. Dan will be missed, yes but he left an indelible mark on my soul as he has many others … he will never be forgotten. My prayers are with you, the families of Dan Otis… May God speed to you in your need. I didn’t know Dan well, however often chatted with him at LaVonne’s and found him to be one of the good guys. A ready smile, always willing to help, always upbeat… you could quickly discern that Dan was a great guy with a big heart. My sincerest condolences to his family and friends. He will be missed… even by those that didn’t know him well. I was so sorry to hear of Dan’s passing, and also so grateful I got to make music with the two of you! My thoughts and prayers are with you. We were stunned to only just recently hear of Dan’s passing and terribly sorry we didn’t attend the funeral, as we surely would have paid our respects. You should know that Dan was a wonderful mentor to our son, Grant, and always encouraged him when he was at LaVonne’s. Grant thought it was the coolest when Dan would sit down and jam with him. He will be dearly missed. Our sincere condolences, the Mussman family.